OH BOY, PO’ BOYS Parish Cafe’s Rob Lippincott says his goal was to put all his favorite foods from New Orleans under one roof. It started with doughnuts. Beignets, to be more precise. Rob Lippincott grew up in New Orleans, where he became a Merchant Marine captain and later a charter boat skipper. He developed a love for the powdery doughnuts and all-things New Orleanian before moving to California. Lippincott worked as a cook at Healdsburg's late Bistro Ralph and then took a job as a winery mechanic before striking upon the beignet trade. He sold the quintessentially New Orleans' doughnuts at farmers markets. He did well, but with a growing family, he had his sights on bigger things. "With three kids, selling beignets at the farmers market wasn't going to cut it," he says, "but it was a start." 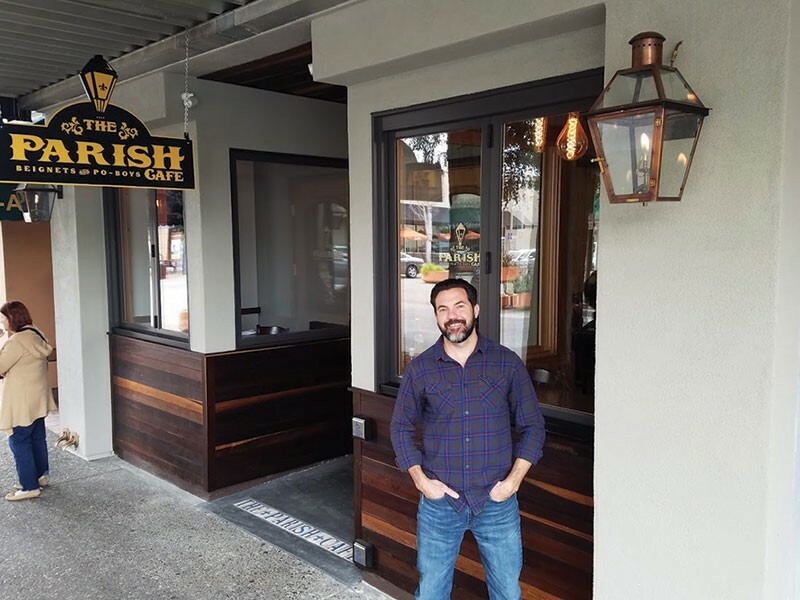 He and his wife Karla opened the Parish Cafe in Healdsburg, and the menu of po' boy and muffuletta sandwiches, seafood platters, gumbo and, of course beignets, was a hit. After four years of steady growth, the couple started looking for a second location. Rob knew the owner of Santa Rosa's La Bufa Mexican Restaurant and heard he was planning to retire. After a year of negotiations, they struck a deal, and the Lippincotts began renovating the Fourth Street business to give it a distinct New Orleanian flavor, right down to the riverboat painting on the walls and twin Bevolo gas lamps out in front. The restaurant has only been open three weeks, and it's already one of the most crowded restaurants in downtown Santa Rosa. Maybe too crowded. Rob says the wait for lunch can approach an hour. The restaurant does not take reservations, but he's trying to cut the wait time in half as the kitchen hones its game. The breakfast and lunch menu is the same as that of the Healdsburg location. "We're going to stick with what works," Rob says. "Everything we make is New Orleans. I tried to put all my favorite food under one roof." That means a menu of Crescent City classics like red beans and rice ($6 cup; $10 bowl), cheese grits and andouille sausage ($14), New Orleans–style egg dishes ($13–$14), fried green tomatoes ($6) and po' boys and beignets ($5). "Beignets and po' boys are our mainstays," says Rob. He says his ideal meal for first-timers would be to start with fried okra ($5) and then move on to a fried shrimp po' boy ($14 regular, or $18 for a king-size). "That is the quintessential New Orleans flavor," he says. For the real deal, be sure to ask for your po' boy "fully dressed"—lots of lettuce, pickles, tomatoes and mayonnaise. Then pair that with a mug of Barq's root beer, he says. There are two Abita brews on tap, but Rob gets a misty look in his eyes when he thinks of the root beer of his youth. "I can smell it right now." To finish? "Maybe beignets. No," he corrects himself, "definitely beignets." The Parish Cafe, 703 Fourth St., Santa Rosa. 707.843.7804.